I have installed Visual Studio 2015 with an .ISO that works for a colleague. On opening the application I've signed into my MSDN account which has an Active subscription. License: Prerelease software This license has expired. 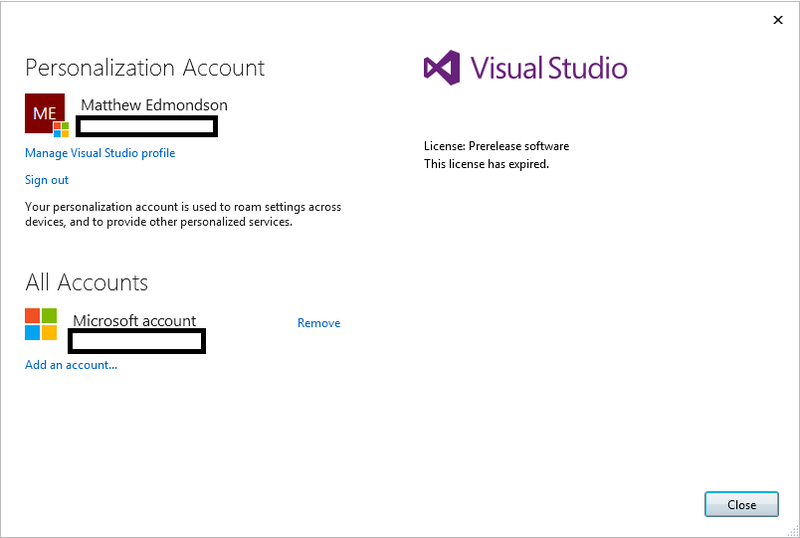 I've no option but to close at this point (pressing the Close button closes Visual Studio completely) – even though I can generate a license key via MSDN I have no way of entering it. Go into Programs and Features and repair the installation of Visual Studio 2015. After the installation is repaired you should be able to open the program successfully. I had this same issue today and these steps worked for me. For me it was a matter of Time / Timezone error. My computer time was set to 06:27 when the actual time was 14:27. Setting the time and timezone to the correct values made VS work again. I solved this problem getting a new Microsoft account at http://www.microsoft.com and sing in Visual Studio. This is the only thing I eventually got to work having this problem with Visual Studio Community 2017! I had the EXACT same problem with Visual Studio 2017! "Prerelease software. This license has expired"
I tried everything above AND a bunch of things you'll probably find BELOW this search result in Google (ie. people at Microsoft can't seem to give a fix either!). DO NOT do what I did and attempt to uninstall all your VS related apps, and .NET & Visual C++ distributions, and then repair/reinstall VS, etc! NOT NEEDED (like some people have suggested) and a complete waste of time! FIX --- Remove the offending product key! BOOM! Jump for joy! I was stumped by this for a few days setting up an old machine as a new dev machine... apparently, I had an out-dated license in there! Hope that helps anyone else that shows up here! Reference: How to change Visual Studio 2017 License Key? Close the IDE, go and create your Visual Studio Online free account. (https://www.visualstudio.com/en-us/products/what-is-visual-studio-online-vs - hope the link works) Open IDE, and click "Check for updated license". .
Login with that account, and hopefully this will work, as with my VS - "License downloaded successfully". The License is syncing across all VS and devices. Not the answer you're looking for? Browse other questions tagged visual-studio-2015 or ask your own question. How to change Visual Studio 2017 License Key? How can I switch my signed in user in Visual Studio 2015? Is it necessary to have a license to use Visual Studio 2015 community edition? Can you upgrade Visual Studio 2015/2017 from Professional to Enterprise?